Working for iBESTT has given me the opportunity to use more of my illustrations skills that I don’t often get to use. This infographic was created to help explain the process used with iBESTT, which begins with a teacher identifying a student that would benefit from iBESTT’s individual-student behavior supports. 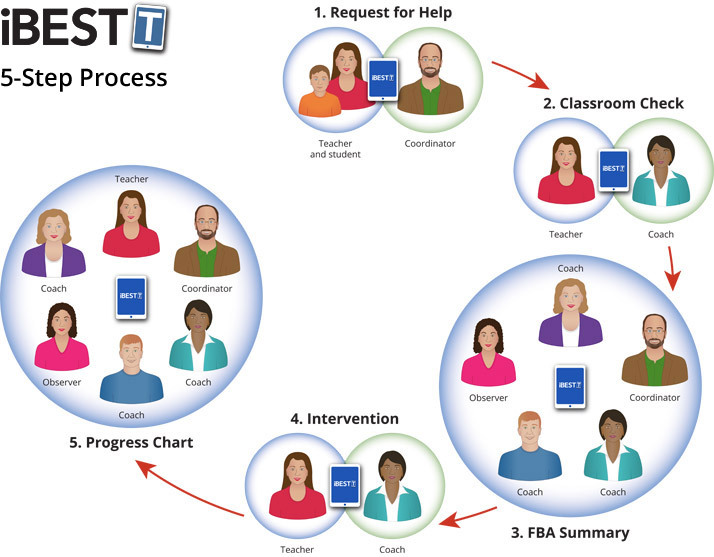 Behavior support teams within the school manage teacher requests for help, and iBESTT coordinates each step of the process. Each person involved (teacher, team coach, team coordinator, and administrator or observer) has role-specific access to the steps needed to guide implementation of the intervention. Each step must be completed before continuing in the process. During the next few months, most of my work for iBESTT will involve creating illustrations that will be used in our training videos. © 2019 Carol Tompkins Design ⋅ All Rights Reserved.